The men’s toilet at Bermagui’s Bruce Steer Pool has been trashed this week in a shocking act of vandalism. Council’s Bermagui Town Team discovered the damage on Wednesday morning as they went about their regular rounds. “This sort of incident really upsets the community and Council staff,” Anthony Basford, Acting General Manger said. The sight that greeted the Town Team on Wednesday morning included, a smashed cistern and toilet bowl, a door kicked off its frame and graffiti. A fire had also been lit which added to the destruction. The toilet will remain closed until repairs can be carried out, as it is unsafe to use. “Whatever the repair bill, and there are a number of items that need to be replaced or repaired , that’s money we need to find that could have gone towards other projects,” Mr Basford said. This vandalism not only impacts on the locals and visitors that use this popular swimming spot but also the community of skaters that enjoy the nearby skate park and the fishing fraternity. “We will do our best to have this asset up and running again before the peak summer season,” Mr Basford said. Alternative public toilets are available in the Bermagui wharf complex and at Dickinson Oval. 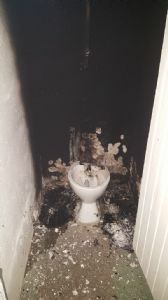 Photograph: A toilet and cistern smashed and burnt at Bermagui’s Bruce Steer Pool this week.